Well, hey how ya doin', have a seat, have a drink. Boy it's good to see you, what can I say? When raised the $40,000 needed to sponsor Al's Star on the Hollywood Walk Of Fame, we knew this day would come, and it's finally here, and it's so exciting! Today we sent sponsorship fee for Al's Star off to Hollywood. Literally... the check's in the mail! Next steps are securing a date for the ceremony, and location for the star, and I can assure you Al and his manager have been working with the folks in Hollywood to shore those up. We'll share any info as soon as we are allowed! Hope to see as many of you as we can at the ceremony this summer! We couldn't have done it without all you amazing contributors! I am beyond excited to be able to go to the ceremony! I have my boss on notice so that when the date is announced, she will immediately schedule me off for a few days! My first trip to L.A., and I can't think of a better reason!!! Attn Weird Al Star Fund contributors -- we want to hear from YOU! Are you planning to attend Al's star ceremony in person? If you think or know that you will be there, please RSVP to [email protected] as we've been asked by the Walk of Fame people to help them gauge how many fans will be attending so they can accommodate the street situation at the ceremony as best as possible. Second, we also want to make sure we have the latest and greatest contact info for all the Weird Al Star Fund contributors. So whether you plan to attend or not, if you are a contributor and haven't heard from Vikki recently, or aren't sure she has your latest contact info, please also contact [email protected] so we can make sure that your contact info is up to date! Thanks for all your help on these matters! Hope to see you all this summer! All three Minnicks will be there. Also in Disneyland in the preceding days so if you see us say hi! Has the date been announced? I'm so excited to be able to go to the ceremony. I have already sent my email to Vikki. When will she be contacting us? I just want to make sure she got my rsvp. Thanks to everyone who had a hand in making this a reality!! Just a reminder -- if you plan to attend the star ceremony in person, please, it's important to RSVP to [email protected] as any minute now, we will need to provide an accurate count, so that the last couple of pieces can fall into place for the ceremony! Elvis wrote: Attn Weird Al Star Fund contributors -- we want to hear from YOU! We're thrilled to announce that Al will receive his star on AUGUST 27, 2018 at 11:30 a.m. PDT! Al's ceremony will happen on August 27, 2018 at 11:30 a.m. PDT. There is a public viewing area that is free for everybody to enjoy. There are no seats, admission fees or reservations required. Space is available on a first come basis. The ceremony will last about 45 minutes to an hour. If you can't attend in person, the ceremony will be streamed live on the Hollywood Chamber Of Commerce website. 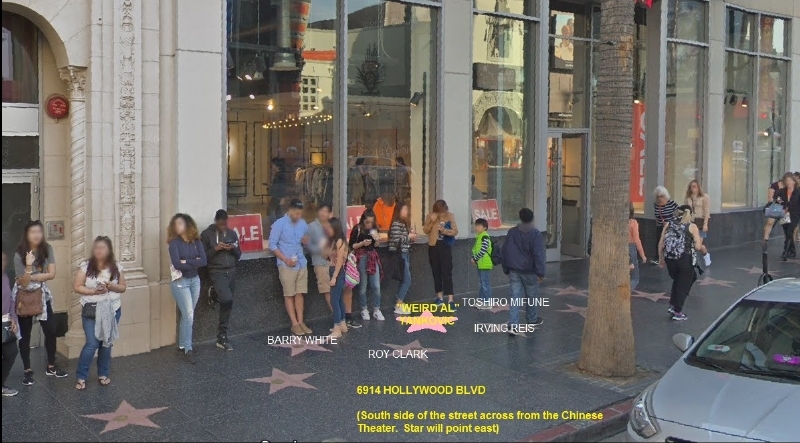 Al's star will be located at 6914 Hollywood Blvd. It is on the south side of the street across from the Chinese Theater. The star points east. His star is in the second row, closest to the buildings, His immediate neighbors in the second row are Barry White to the east, and Toshiro Mifune to the west. His immediate neighbors in the original row are Roy Clark to the east and Irving Reis to the west. The celebrity presenters will be Thomas Lennon and Dr. Demento. Visit us at http://www.weirdalstar.com for more details!